UGANDA: Parliament Erupts Into Brawl Over Attempt To Extend Reign Of Dictator Yoweri Museveni [VIDEO] - Joe.My.God. As lawmakers debated one of the country’s most important bills, Uganda’s parliament turned into an ultimate fighting ring. 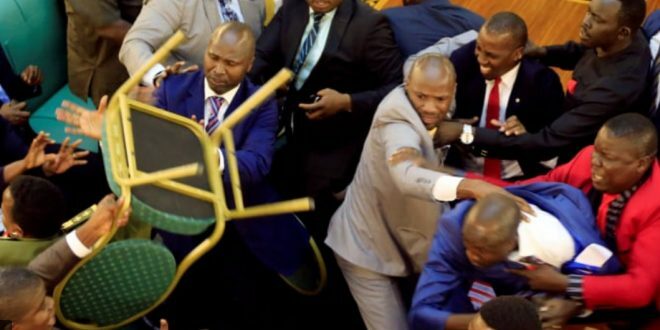 Parliamentarians hurled chairs at each other and swung microphone stands like swords. Men were torn from the room by their blazers and women by their dresses. Some people wailed and cried. That fight exposed the bitter rift between lawmakers who support President Yoweri Museveni’s efforts to extend his rule and those who oppose it. Museveni, 73, has been president for 31 years. Uganda’s constitution says no one older than 75 can run for president, which would effectively prevent Museveni from running for reelection in 2021. Some parliamentarians want to introduce a bill that would change that law, allowing the president to extend his rule. Museveni is among a growing group of African leaders — in Zimbabwe, Burundi, Rwanda, Congo and other countries — who are trying to stay in power by changing or defying their countries’ laws. Museveni has banned future broadcasts from parliament.